Fun and creative, MRhythmizer gets one over on its most obvious competitor with an onboard filter, great price and all the usual Melda niceties. Easy to use. Sequence Graph is extremely flexible. Scratch parameter is fun to mess with. Filter is a welcome addition. Reasonably priced. Not exactly innovative. Filter section is very basic. There's something about MRhythmizer (VST/ AU) that's very familiar. It's not the interface - although that does indeed adhere to MeldaProduction's standard (dare we say, becoming rather visually tedious?) graphical template - but rather its functionality, which is extremely similar to Image-Line's Gross Beat, which we awarded four stars way back in 2009. "As with all MeldaProduction plugins, though, there are tons of stock features to play with, too"
Gross Beat's volume, level and time manipulation enables the creation of DJ-style effects including rapid cutting, scratching and spinbacks. MRhythmizer goes one better and throws a band-pass filter (with discrete high- and low-pass cutoff frequency settings) into the mix. Despite its busy interface, using MRhythmizer is straightforward enough. Each of the three modulatable parameters (Time, Volume and Filter) has access to 36 editable 'sequences' (envelope shapes), which can be triggered by the buttons on the left-hand side of the Sequences panel. Clicking a button to switch sequences generates host automation data, too, making it easy to punch into and out of sequences in your DAW. The three tabs at the top of the button matrix switch between the sequence button banks for each parameter, and as well as clicking, sequences can be selected via MIDI note input - great for 'playing' the effect in real-time. The Time, Volume and Filter modulators can all be active simultaneously, of course (mapped to 108 MIDI notes), so the potential for crazy effects combinations is considerable. The included presets (each of which fully populates the plugin's 108 sequence slots) make it easy to explore the full range of the plugin's capabilities. We imagine most users will be happy using it to add the occasional predefined spinback or 'trancegate' effect, but there's plenty of scope for getting more involved. The Sequence Graph panel is where the selected sequence is edited. Double-clicking creates a breakpoint, which can be made sharp, shallow or anywhere in between with what Melda call their "horizontal pull rod", while line curvature between points is adjusted by dragging at their midpoint. Further control can be taken by right-clicking the Sequence Graph for a menu of options including curvature and smoothing settings for the sequence as a whole. It's a well-designed and effective system that makes creating complex envelope shapes a snap. Aside from a few global parameters for the Volume envelope (Depth, Attack and Release) and Filter (Attack, Release, HP and LP frequency), and the unusual Scratch control, that's pretty much it for MRhythmizer-specific stuff. As with all MeldaProduction plugins, though, there are tons of stock features to play with, too, including randomisation functions, auto-gain compensation, upsampling, scene morphing and much, much more. MRhythmizer is fundamentally a very simple plugin. The manual does its best to make it look terrifying, but dive in and you'll find it easy to get to grips with. 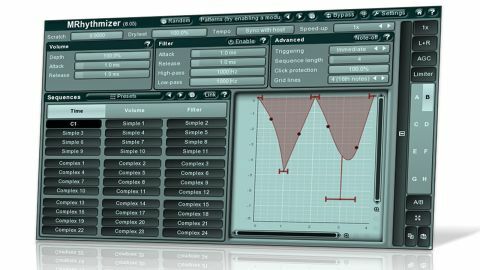 The filter section could be bulked up - there's no resonance control, let alone drive or a choice of slopes - but even so, MRhythmizer makes a worthy rival to Gross Beat. Plus, it's Mac-compatible and slightly cheaper. If you're after a fun new way to mess with your sounds, MRhythmizer could well scratch that itch.